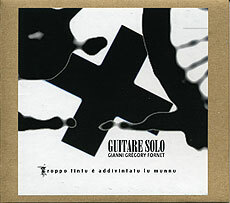 Gianni Grégory Fornet, guitars, samplers; Tuan Anh Bui, voice (track 2). Recorded August 2006 at Chapelle Fromentin, La Rochelle. Stickers and graphic conception (front cover reproduced above) by Jean-Michel Bruyère.